The "Recherches archéologiques" collection publishes, for the scientific community, monographs and syntheses resulting from preventive archeology operations carried out by Inrap. These works are distinguished by the major character of the sites studied, their innovative aspect in methodological or scientific terms, or the size of the territory taken into account. 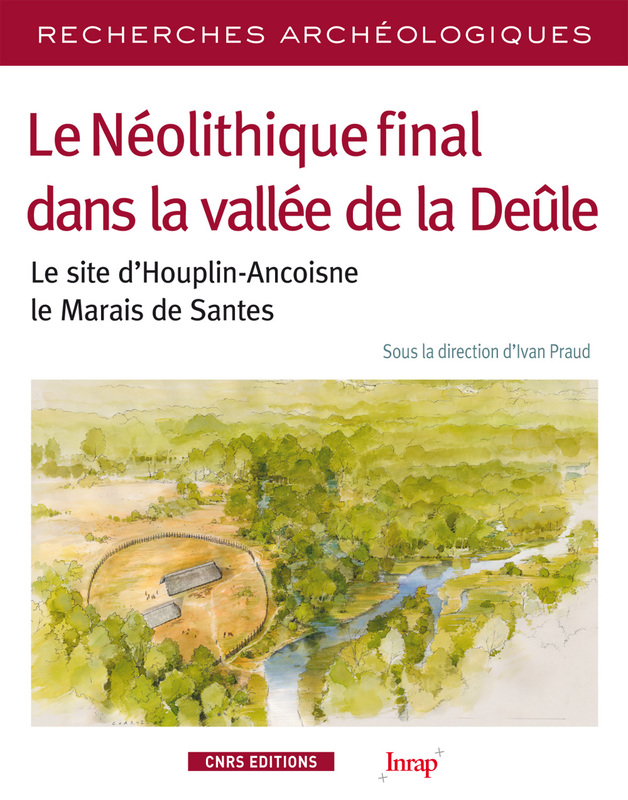 The discovery of a vast architectural group including a palisade and buildings dated to early 3rd millennium BC on the edge of the Deûle Valley at Houplin-Ancoisne le Marais de Santes constituted a starting point for the identification of regional dwelling structures dated to the Final Neolithic. The excavation of a surface greater than one hectare, situated in a valley bottom, revealed (among other things) a discard zone preserved in a paleo-channel of the Deûle, which was filled-in during the Holocene. The organic remains trapped in the meander created the unexpected conditions and favorable environment for collecting samples in a reliably determined chronostratigraphic position, for paleoenvironmental analyses. The environment thus perceived in the vegetal assemblages around Marais de Santes evolved from a marshy landscape bordered by a thick and dense riparian forest to an oak grove enriched with ash, developing both on cool, humid soils and on better drained ones. This forest offered a true continuity between these different landscapes. Faced with a growing quantity of naturalist and cultural information, a multidisciplinary approach was the only one capable of measuring the amplitude of interactions between the natural environment and the society. The exceptional nature of this site, illustrated by the monumentality of the main building, justified a complete publication of the artefacts and their analysis, thus enabling a renewal of our knowledge of the Deûle-Escaut cultural group. Authors: Vincent Bernard, Ève Boitard-Bidaut, Muriel Boulen, Séverine Braguier, Sylvie Coubray, Laurent Deschodt, Marie-France Dietsch-Sellami, Jacques Fabre, Kai Fechner, Gaëtan Jouanin, Yolaine Maigrot, Emmanuelle Martial, Laurent Michel, Cécile Monchablon, Richard Palau, Phillipe Ponel, Ivan Praud.